The CRC-12 is tailored to fit the Sony EX3, Canon XL HD1 and similar models featuring a unique viewfinder sleeve which allows usage when flipped open to use the LCD screen. 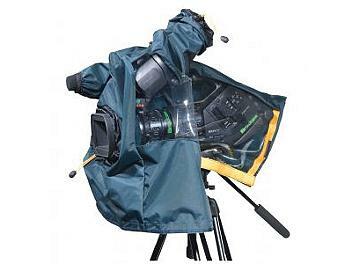 The cover slips quickly over your camera to protect it from sudden showers and is secured by a quick of drawstrings. Kata rain covers were tested in a weather laboratory and successfully protected equipment during severe weather conditions. 1.Quick pull drawstrings allow closure around lens with one hand. Simply pull to tighten. 2. Bottom opening allows for full protected usage when shooting with tripod or handheld.
. Waterproof materials completely encase the camcorder to shield it from sudden downpours while not obstructing functionality. 2. Drawstring closes tightly around viewfinder to prevent water from entering when not in use. Crystal clear TPU panel allows control monitoring and viewing of the LCD screen. 1. Side controls are visible at all times when cover is installed. 2. Rear velcro opening allows you to connect cables to the rear of the camera.